PYONGYANG, North Korea (AP) — In an instructional television program about table tennis on the state-run sports channel, every ball, paddle and shirt bear the logo of “Naegohyang,” one of North Korea’s most recognizable brands. A documentary about the Pyongyang Maternity Hospital ends with new mothers being handed smartly packaged disposable diapers — with the local brand featured prominently. Has North Korea discovered the art of product placement? Subtle shifts like the quiet insertion of what looks a lot like advertising onto the North Korean airwaves exemplify how in the era of leader Kim Jong Un the North is learning to embrace its inner consumer. Officials won’t come right out and say so, but the rise of a consumer culture is a major feature of Kim’s plans to strengthen the economy and lift the people’s standard of living. Entertaining and innovative aren’t words often used to describe North Korean TV, which has just one channel available every day throughout the country and just a few more a few days a week in Pyongyang, the capital. Programming is relentlessly ideological and always on-message. But examples like the Naegohyang-laden table tennis program suggest at least some officials within the regime have been given a green light to push the envelope. And it’s not just happening on TV. While the rest of the world has been focused on its nuclear weapons and missile tests, North Korea watchers have remarked on the spread of market-style capitalism ever deeper into the country’s officially socialist and centrally controlled economy in the past few years. The evidence is unmistakable — from the haggling-friendly, bazaar-like atmosphere of Pyongyang’s Tongil Street marketplace to street-food stalls and the prominence of brands like Naegohyang, seen on cigarettes, liquor and sporting goods including, of course, ping pong balls. Exactly how the country has maintained domestic economic growth despite some of the toughest international sanctions it has ever faced is a topic of hot debate. Most experts agree China is a major factor. But what is often overlooked is the role of the North Koreans themselves, especially those who developed an entrepreneurial spirit after the dark days of the 1990s, when the Soviet Union and its socialist satellites crumbled and natural disasters and bureaucratic inefficiency meant that survival literally often meant learning how to fend for oneself. The rise of the North Korean consumer under Kim is not limited to the affluent, politically privileged elite. In Kim Jong Un’s North Korea, you don’t need to be the spoiled daughter of a senior official to be able to get a strawberry smoothie. Still, the consumer sector remains warped, as it does in many developing countries with large disparities of wealth. Millions of North Koreans still suffer from poor diets and a lack of clean water, struggling through the country’s bitterly cold winters. Farmers out in rural collectives lack the time, energy and income to worry about what flavor ice cream they might fancy. But there are plenty of people that might. It is for that demographic the O-Il General Process Factory boasts 55 flavors of “Eskimo,” the word used here for popsicles. That’s in addition to full lines of ice cream cones, yogurt drinks, jellies, sports drinks, milk products and assorted juices — all of which are featured in a glossy new promotional brochure obtained by The Associated Press that is directed at potential foreign export partners. The factory is no Potemkin bluff — its products can be found in stores and restaurants all over Pyongyang. 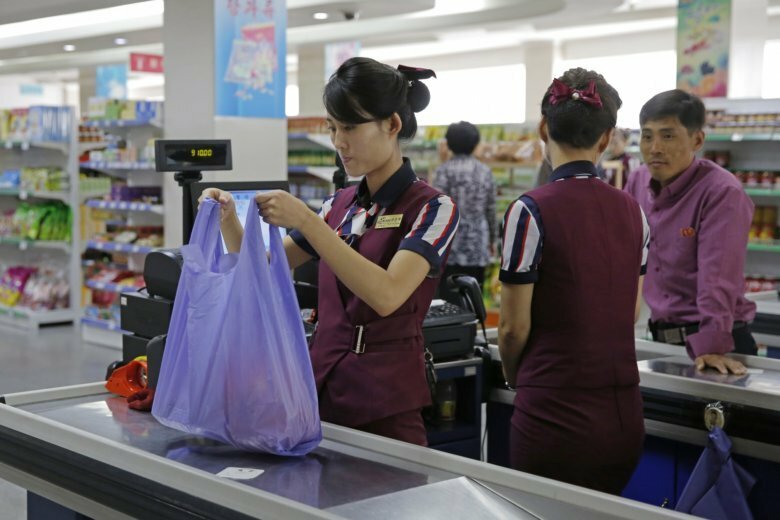 Shops and department stores in other major cities, such as Wonsan, Hamhung and Chongjin on the east coast and even smaller stores in the provinces have shelves full of chips, sugary drinks, cigarettes and candies. The focus on variety is more akin to what’s found in a capitalist consumer culture than in one that’s more strictly socialist and utilitarian. The trend has the leader’s blessing. Factory managers, restaurant operators and people in the service industries have all been quick to stress to the AP over the past several months that the central government, and Kim himself, want the country to focus its collective energy on pushing out more and better consumer goods. Beyond that, doctors say they are being urged to help to raise the standard of living, despite a chronic lack of supplies and equipment, by finding innovative ways to fight threats like tuberculosis, decrease infant mortality and increase life expectancy. Many outside of North Korea assume that wanting to catch up with South Korea is the biggest factor behind Kim’s campaign. But the regime has its own reasons for tweaking its system. Kim has big plans for the country’s economy. More business means more he’ll have more money to fund those plans. And big, state-owned companies like Naegohyang aren’t disruptive outsiders but part of the North’s status quo. They’ve been likened to the “Chaebol” conglomerates like Samsung and Hyundai that dominate the South Korean economy. For now, advertising is still somewhat avant garde. The capital has only a few billboards, all of them for Pyonghwa Motors, an automaker set up with help from South Korea. The few neon signs shining from the tops of buildings convey praises of Kim and his forefathers, or political slogans. But the ground is clearly shifting. TV viewers who tuned in a few minutes early for the nightly news broadcast recently were treated to what can only be seen as the next best thing to a true ad — an “educational” short featuring recipes that all included a kind of fermented apple vinegar, followed by testimonials from satisfied customers and a display of those very vinegar products as one might see them in the store. Stay tuned. The next revolution may, indeed, be televised.